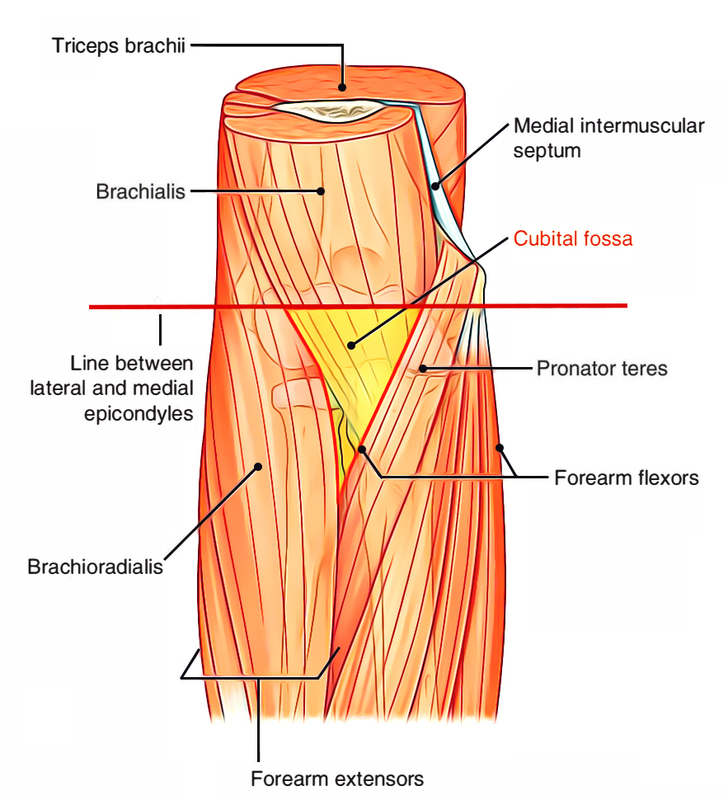 The Cubital Fossa is corresponding or homologous to the popliteal fossa of the lower limb. It is a triangular hollow in front of the elbow. Lateral: Medial border of brachioradialis muscle. Medial: Lateral border of pronator teres muscle. Base: An imaginary horizontal line, joining the front of 2 epicondyles of the humerus. Apex: Meeting point of the medial and lateral borders. Here brachioradialis overlaps the pronator teres. Floor: It’s created by 2 muscles, brachialis in the upper part and supinator in the lower part. 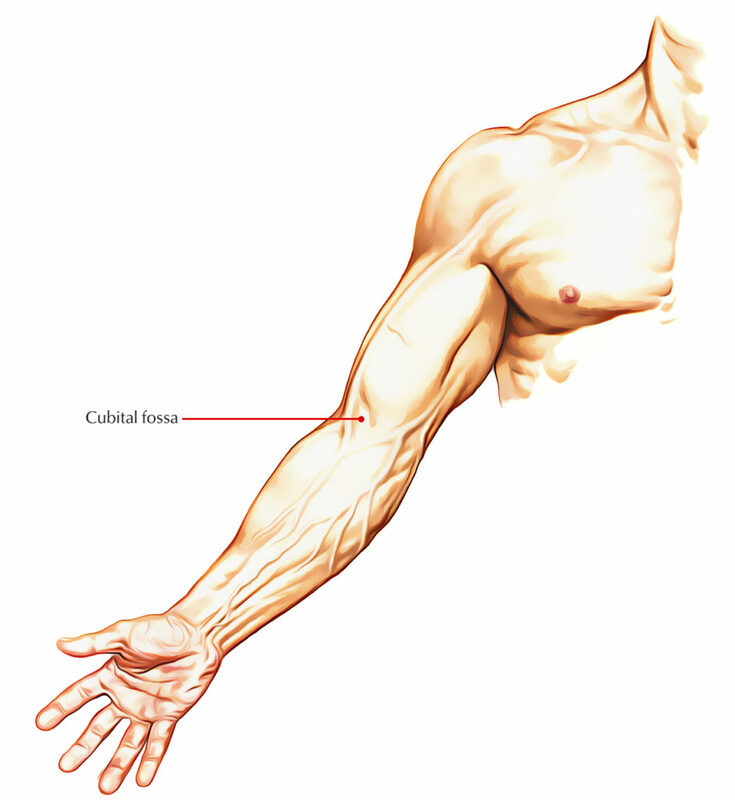 The cubital fossa is really narrow space, and for that reason, its contents are shown only if the elbow is bent and its margins are pulled apart. Median nerve: It leaves the fossa by passing between 2 heads of pronator teres. 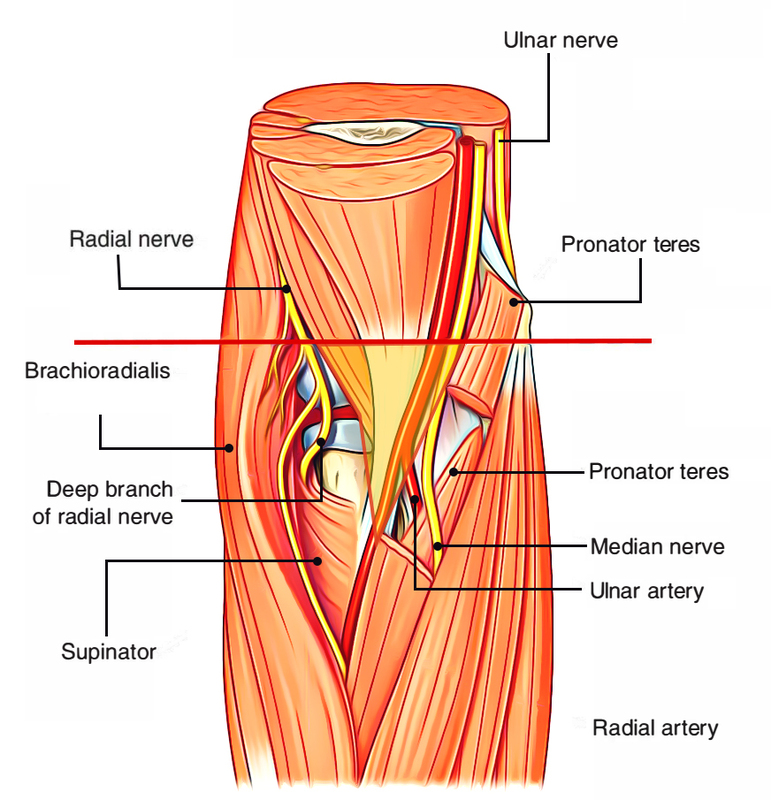 Brachial artery: It ends in the fossa in the level of neck of radius by splitting into radial and ulnar arteries. The radial artery is superficial and makes the fossa in the apex. The ulnar artery is deep and enters deep to the pronator teres. 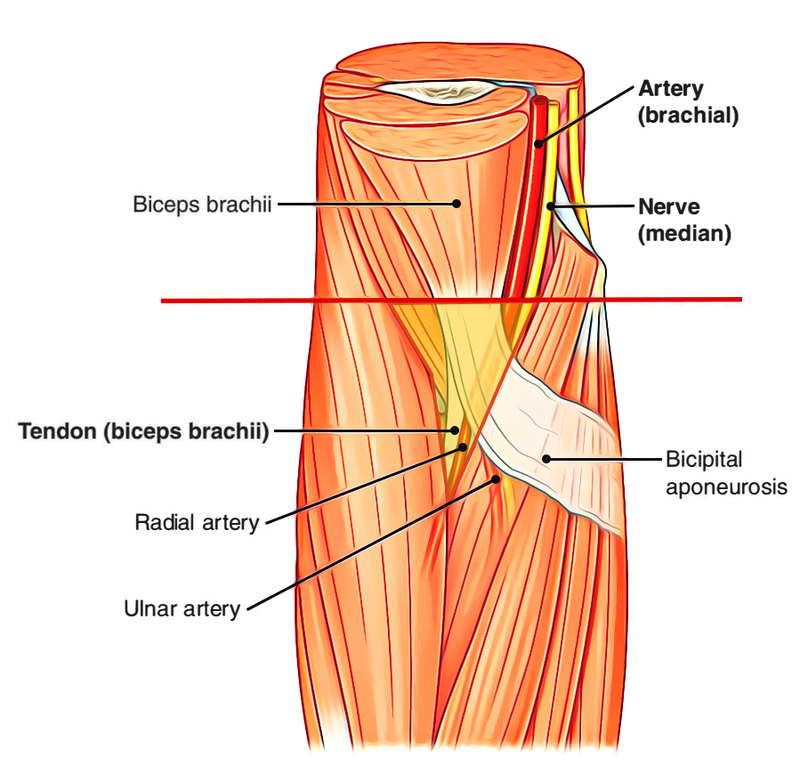 Biceps tendon: It enters backwards and laterally to be connected on the radial tuberosity. Radial nerve: It is located in the gap between brachialis medially and brachioradialis laterally. At the level of lateral epicondyle it breaks up into 2 terminal branches: (a) superficial radial nerve and (b) deep radial nerve. The latter vanishes in the substance of supinator muscle. 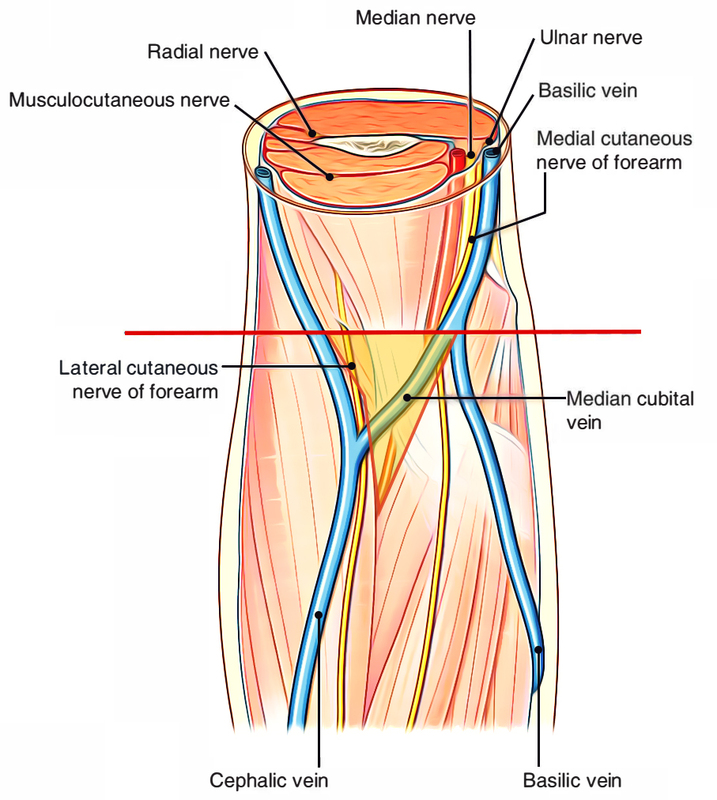 The superficial radial nerve enters downwards under the cover of brachioradialis. The median cubital vein in this region is the vein of selection for gathering blood samples and giving intravenous injections. The brachial pulse in this region is easily felt medial to biceps tendon, for recording the blood pressure. To take care of the fractures around elbow, viz. supracondylar fracture of the humerus. The contents of cubital fossa notably the brachial artery and median nerve are exposed in supracondylar fracture of the humerus.